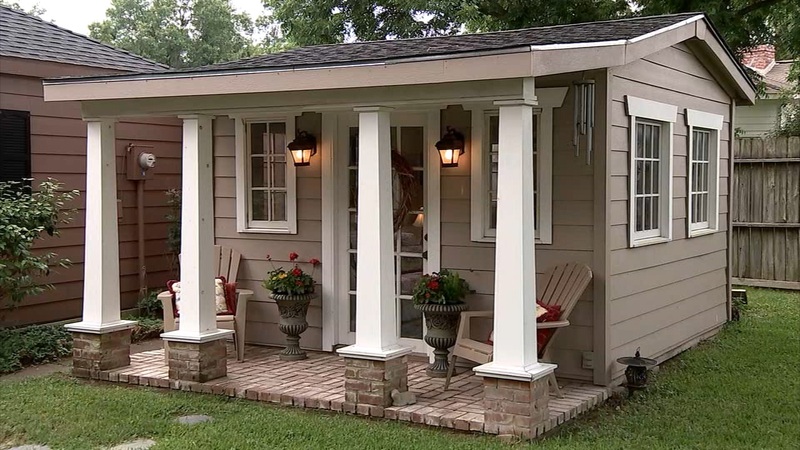 HOUSTON -- Men have their caves, and now women have their sheds. "She Sheds" are a new trend sweeping the nation that allow women to escape to their own personal private retreats, without leaving home. Nestled behind Tamara Harbert's Houston home is her great escape into a little backyard bliss. It's being away, without being away, which I love," said Harbert. A She Shed is much different from a man cave, but the quaint 144-square-foot bungalow serves a similar purpose. "I read in there, I do paint in there, now I'm doing some collages - I love color," Harbert said. "I love eclectic things. I love antiques," Harbert said. Her She Shed is decked out with her own style and equipped with an air conditioner and ceiling fan, so she is able to "shed her stress" year round. She uses the space for arts and crafts, or getting design ideas for her next project. "I can sit and read in my house. But I'm also looking around thinking to wash the windows. I need to do the laundry. Look at that dust over there. I'm in here I'm not thinking that," Harbert said. Her little getaway is filled with furniture and decor that she has collected and repurposed over the years. "Everything in there is either something someone was throwing out, or things that we've made," Harbert said. "Things you'll find in there. My daughter would paint a rock, or glue something together. I kept it, it's in there." The shed was originally built for their children by her husband Stuart. The project took nearly 9 months to finish. "I wanted to build a playhouse and I looked online at existing projects and said, 'I want to see if I can try that myself,'" said Stuart Harbert. To keep costs down, they used a lot of repurposed material from the Habitat for Humanity ReStore. "The door, the windows are reclaimed. The bricks on the porch are also reclaimed bricks," Tamara Harbert said. But as the children grew, it would not be a playhouse forever. "It was actually meant to be a transition to my wife so she could use it for a little retreat. But then if the grandkids come back, then we're all set for a future purpose," Stuart Harbert said.